Cities around us - sachayacu-ev Webseite! 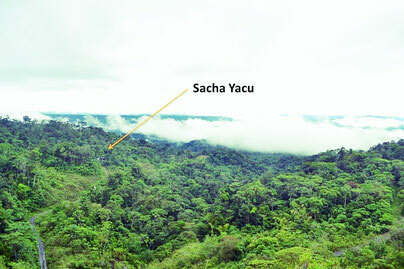 Sacha Yacu is located in the Amazon region ("El Oriente") of Ecuador, about 1 hour drive from Puyo, on an area of about 80 hectares of rainforest. If you arrive in Quito after 12PM, it is recommended that you stay in a hostel the first night as it can be quite dangerous to travel by bus at night. Sunset is around 6PM year-round. 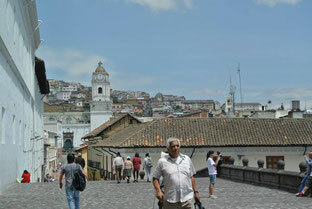 There are many inexpensive and well-kept hostiles in Quito. The following suggested hostels do not have a special relationship with Sacha Yacu, but are located in Old City Quito, which is the most popular tourist area. They are both just a 15-minute cab ride from the airport and approximately 20 minutes to the main bus station. Take a taxi to Terminal Terrestre de Quitumbe. You will need to get a bus to Puyo (about 5 hours, approximate cost US $7.20). It is recommended to take a direct bus during the day. Terminal Quitumbe – the main bus terminal in the very far south of Quito. Inside, you will find booths that sell tickets to every part of Ecuador. Find the booth for Puyo (it may also say, “El Oriente”). There are several bus companies that go there, and the buses leave as frequently as every 30 minutes. “San Francisco” is one of the better ones. Make sure you buy your ticket for the next departing bus (they may try to sell you something for a later bus). You will get two tickets - one to hand to the guard on your way out of the bus station, and one to show to the attendant on the bus once the bus starts moving. To catch your bus, go outside to where the buses are parked, and find the assigned parking position (the # on your ticket). Be very careful with your bags in the bus terminal. Leave NOTHING out of sight, or unattended. It will be stolen. Also, there is usually no (working) toilet on the bus. It is $0.15 to use the WC in the bus terminal. Keep a watchful eye on your things in the bus. There will be tons of people getting on and off, and some of the towns you pass through will not be the safest. Don’t be surprised if the police stop the bus several times, and even get on the bus and walk around. This is normal procedure and is for your safety and benefit. ***Don’t worry – catching the bus is super easy! Just be careful like anywhere else. Note: It is advisable to call when you’re in Puyo, to be attentive to your arrival. To get to the Sacha Yacu Center by BUS, you will need to take a taxi to la parada de bus a Arajuno which is by ‘El Mercado Mariscal’ from the main bus station in Puyo (where you will arrive from Quito). There are two different bus companies you can use to get to the center – San Francisco and Centinela del Oriente. Their offices are close and you can see them easily from the market. The buses run every hour until 6:00 pm and then again at 8:00 pm and cost US $1.85. 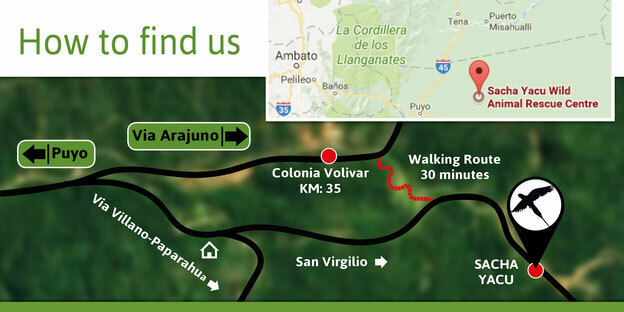 You need to ask the bus driver to drop you off at KM 35, “kilometro treinta y cinco”, on the way to Arajuno. After approximately 45 minutes of driving (or more if many stops are made) past various communities, you’ll get to a small community named El Triunfo and 10-15 minutes. 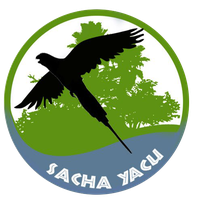 After that you must pay attention and look for a sign on the right side of the road which reads, “Sacha Yacu Animals Rescue Center 2 km“. If you have reached this, stay 2 more kilometers in the bus. After a few houses you will see a second, small sign on the right side. Get off the bus here and follow the path down the hill (ca. 25 minutes). 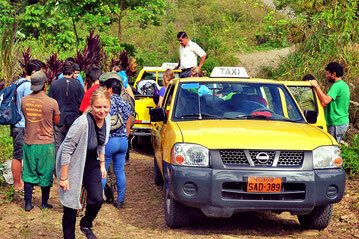 The easiest way to get to Sacha Yacu is by TAXI. The drive is about 45 minutes, and costs $20-25 USD. For the taxi, ask to go to Km 34 via Arajuno. Merge to the right towards Villano Paparagua and continue for 1km. Merge to the left towards San Virgilio and continue 1km. 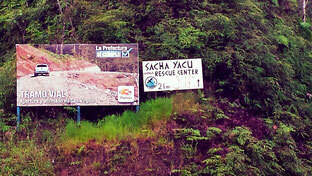 Look for the sign for Sacha Yacu on the right. They will know your destination so you will not have to worry about getting lost! Also you can call us when you arrive at the Puyo bus station and we can call a taxi for you. 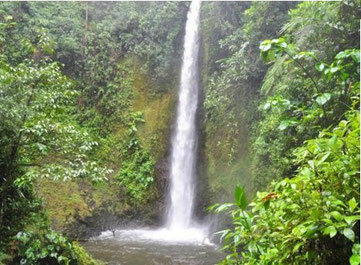 The closest small town is called El Triunfo, a mere 20 minute bus ride from Sacha Yacu. Although you will not find internet or phone access here (perhaps coming soon!). You can visit a couple of mom-and-pop type bars and shops to restock on snacks and mingle with the local people. Another forty minutes down the road (at an hour ride on the bus from the center), you will find Puyo. Puyo is the largest local town and offers a variety of services like laundry facilities, loads of Internet cafes, bars, clubs, and shops. They even have a water park! 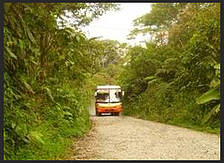 Puyo, also known as El Puyo, is the capital of Pastaza, a province in Ecuador. Puyo is located at an altitude of approximately 950 feet above sea level by the Puyo River, a tributary of the Pastaza River, which eventually leads into the Amazon River. True to its name, derived from the Quechua word for “cloudy”, the local climate is a wet one, with frequent daily downpours in a mix of sun and rain. Puyo was founded in 1899. Located between Baños, and the Amazonian cities of Tena and Macas, Puyo is the commercial, cultural and political capital of the region. The city is connected by road to Ambato,Tena, and Macas and from there to the major urban areas of Ecuador. In late 2006, the city had approximately 25,000 inhabitants. It was the fastest growing city in Ecuador in 2006.The seasonal changes in the climate are relatively small, and daytime temperature typically range between 18-24 °C, (64°F -75°F), though it can be quite a bit hotter mid-day. 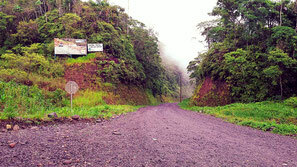 A small airport is located in the small town of Shell, approximately 10 kilometres north-west of Puyo. Small aircraft, both private and commercial, depart daily to small airstrips in the Amazon Rainforest, and occasionally to Quito in the case of severe medical emergencies. The Puyo Carnaval, a famous Ecuadorian holiday, is celebrated each year in the days leading up to Lent. The custom is to have small neighbourhood parties, and water fights are sometimes involved. 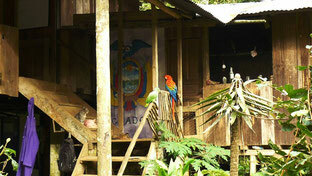 Other major holidays are the Day of the Ecuadorian East Amazon on February 12, and the chonta-palm festival.